ProFishNC Charters Spring Fishing is HERE! 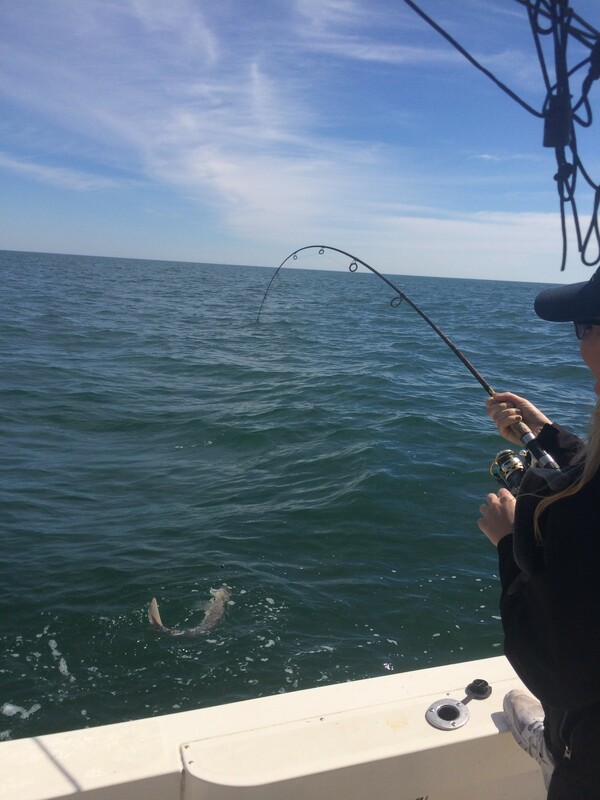 Whats Happening Right Now: Our water temperatures are climbing every day and and are currently at 59-60 degrees (perfect fishing temps for Black Seabass, Tautog, Porgies and a variety of Sharks! The Red Drum are feeding as well and can be target in the surf zones right now. The Black Drum are lurking inshore in the docks, inlets and backwaters looking for an easy meal. This time of year I target/ Fish for Black Drum with clams and shrimp. The bigger Seabass are moving back into the 3-5 mile range again (from the 10 mile range). I am targeting the larger Black Seabass using glow jigs that imitate squid and bouncing them on the ledges and around our many nearshore shipwrecks and reefs. 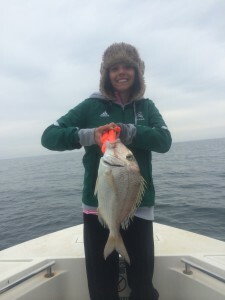 Using good ‘ol cut bait/ squid or bait shrimp will catch any and all sized Seabass right now! On our Topsail Beach, NC Fishing Charters we are catching the Big Porgies which were here in numbers last week in the 5 mile range (they are a very tasty and rarely fished for “treat” we catch this time of early spring). The Spanish Mackerel will be here very soon; however, first comes the Atlantic Bonito (the edible variety of Tuna!). The Atlantic bonito will here in a week or so and will be fun top water and sight fishing action! Note: We fish all of our area beaches including Topsail Beach, Wrightsville Beach, Carolina Beach, Figure Eight Island and Wilmington, NC Fishing Charters. Your Fishing Options: Inshore the Flounder are moving in fast and the Giggers are racking them up. The Black and Red Drum are feeding inshore, though they are still a little lethargic. (honestly though, give it another two weeks for better action). Around April 10 – 15 the Inshore Fishing Turns on light a LIGHT! We will have the Big Bluefish (8-20 lbs) show up inshore along with hungry Drum and Flounder. Nearshore/ Offshore: Right now the best game in town is Bottom Fishing in 45-75 feet of water. I am using glow squid jigs (tipped with squid) and cut bait and live bait (caught with sabiki rig) on 7/0 Circle hooks and just enough weight to get it down to the bottom. On our upcoming Wrightsville Beach, NC Fishing Charters we will be fishing MANY sight fishing trips for Atlantic Bonito, Spanish Mackerel and King Mackerel coming up in the next few weeks and going through the end of May. If you have never casted to a breaking/ feeding/ busting school of tuna or mackerel 3 miles off the beach on light tackle, you need to give it a try. Dolphin Sight Seeing Trips! 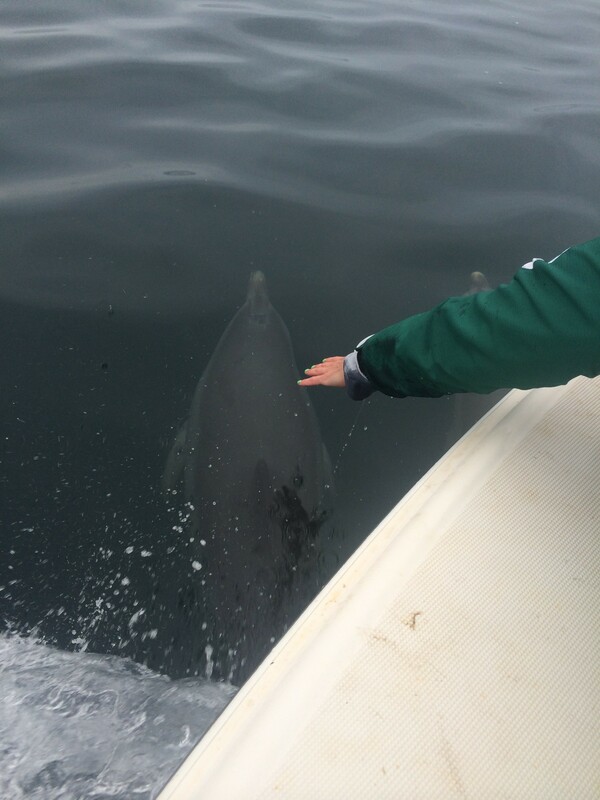 We are blessed to have such a great migration of Dolphins in our are that we at ProFishNC Charters are now offering Dolphin Sight Seeing Charters for our guests. 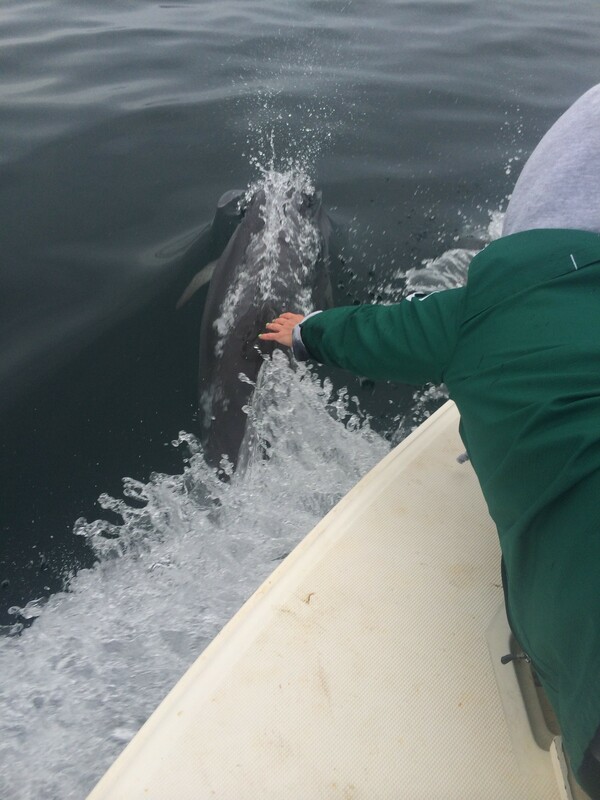 This week was exceptionally great as this Dolphin Pod was about 3 miles offshore containing at least 500 Dolphin and they let us PET THEM! Note: We are booking up exceptionally fast this season (especially for sight fishing Bonito/ April 15-May30) and recommend booking your fishing charter sooner than in previous years… I guess the cold winter has anglers needing some fishing therapy! Feel Free to call me anytime to discuss your fishing options! Tight-Lines and hope to fish with You soon! 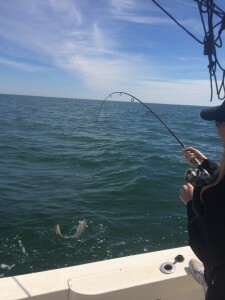 This entry was posted in Fishing Reports, ProFishNC News, Uncategorized and tagged Bottom Fishing Charters, Spanish Mackerel Fishing Charter, Wilmington Fishing Charters on March 28, 2015 by admin.